13th April 2019, New Delhi: The world’s largest election kicked off this week with voting taking place under phase 1 on April 11. With a total 91 Lok Sabha constituencies going to polls on April 11, many Indians exercised their right to vote. But as per many citizens, there were unable to vote due to their inability to get their voter id card on a timely basis. LocalCircles conducted a survey to determine the citizen pulse on their readiness for the elections and exercising their right to vote. The 4-poll survey received more than 29,000 votes from over 16,000 unique citizens of the country. 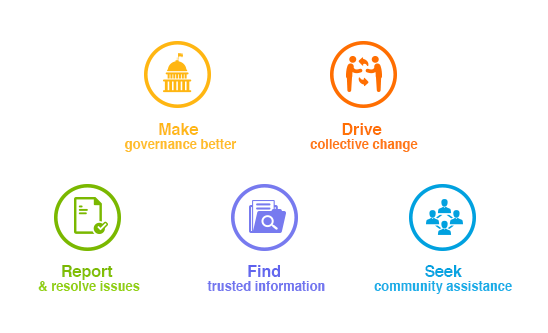 The first question asked citizens what their situation regarding voting in the upcoming Lok Sabha elections was. 83% said they will vote with a voter id card or a voter slip and 4% said they will not vote. 10% said they want to vote but have not received their voter id card or don’t have booth information while 4% said they have not decided yet. 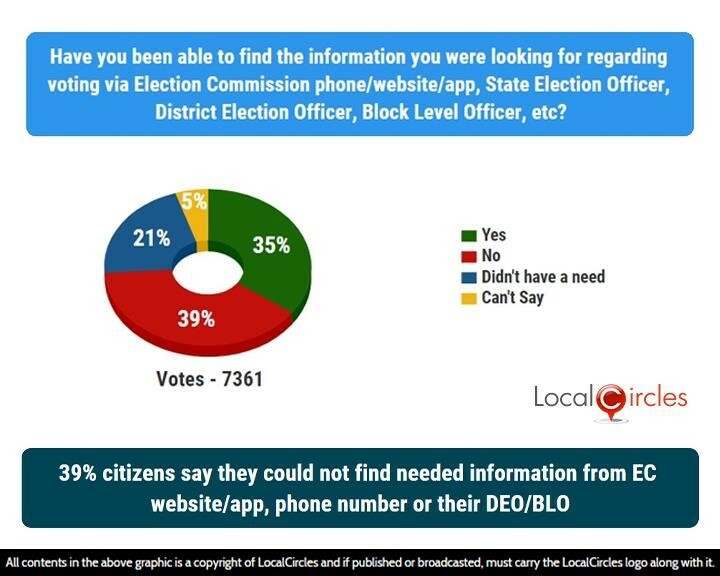 The second question asked citizens if they were able to find the information that they were looking for regarding voting via Election Commission phone/website/app, State Election Officer, District Election Officer, Block Level Officer etc. 38% answered in a ‘no’ while 35% answered in a yes. 22% did not have a need while 5% were unsure. According to the Election Commission of India, there will be around 8.4 crore first time voter in this election. The number would be even higher, if the smaller issues could be eradicated. Many citizens reported that they could note cast their votes either because they have no voter id card or because their name was not there in the voter list. Following question asked if they or their family had not received the voter id card, then where is it stuck? 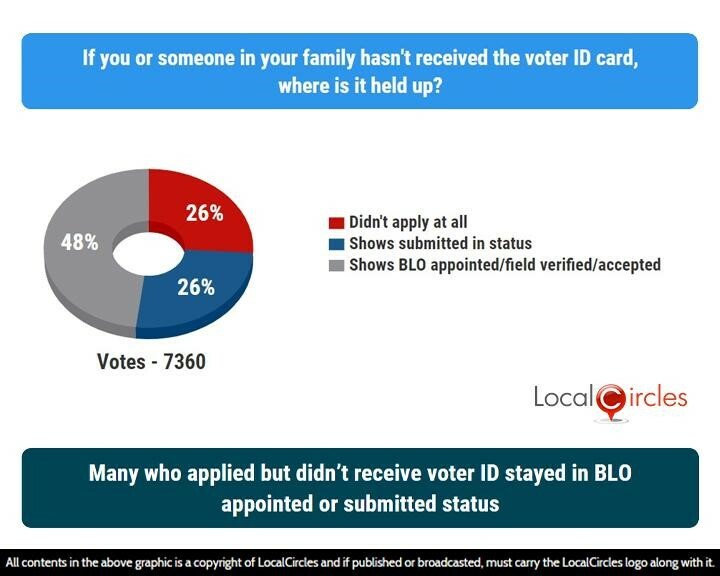 16% said it showed BLO appointed/field verified/verified/accepted and 8% said it shows ‘submitted’. 8% did not apply at all and 67% said it was not applicable to them as all adults already had voter id cards. There are reports that 15 booths in Odisha received zero voting. This is not good news for the world’s largest democracy. We need more and more people to come out and vote so that the right candidate could be selected, democratically. The final question asked how the Election Commission can make the process of obtaining/modifying voter id card faster and efficient. 62% said application should be online application and download with Aadhaar authentication. 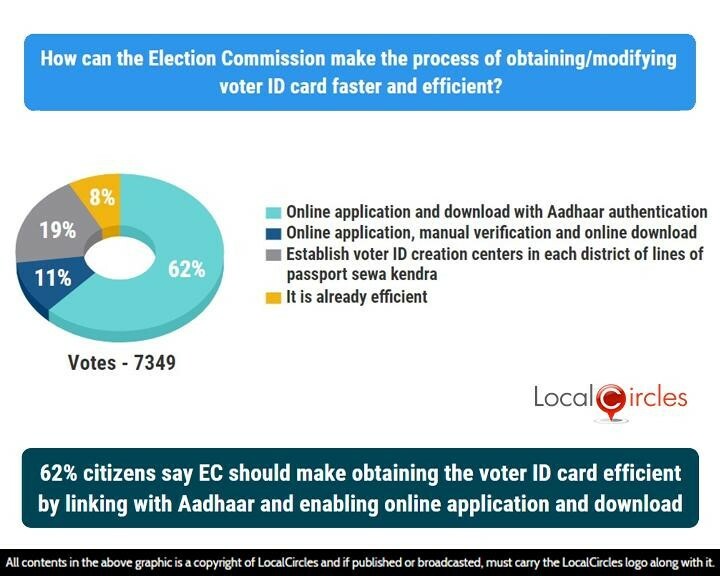 11% said online application, manual verification and online download, while 18% said establish voter id creation centers in each district on the lines of Passport Seva Kendra. 8% said the process is already efficient. There have also been reports from the Shamli region where BFS had to fire in the air to contain a bunch of people who wanted to vote but did not have their voter id cards. Such incidents reflect badly on ECI’s pre-preparations for elections. Citizens have also said that the process of getting voter ids should be made easier with the help of Aadhaar authentication and online availability. While for those voters where polling happened on April 11, the opportunity to vote next will now only come in the next state election. For many others though, where polling is happening in the coming weeks, citizens hope that the Election Commission will take note of the above public pulse and take action so those waiting for voter id cards, get them in digital or print form. For, 10% voters is a sizable number and it could very well be higher if all rural and migrant population is accounted for. 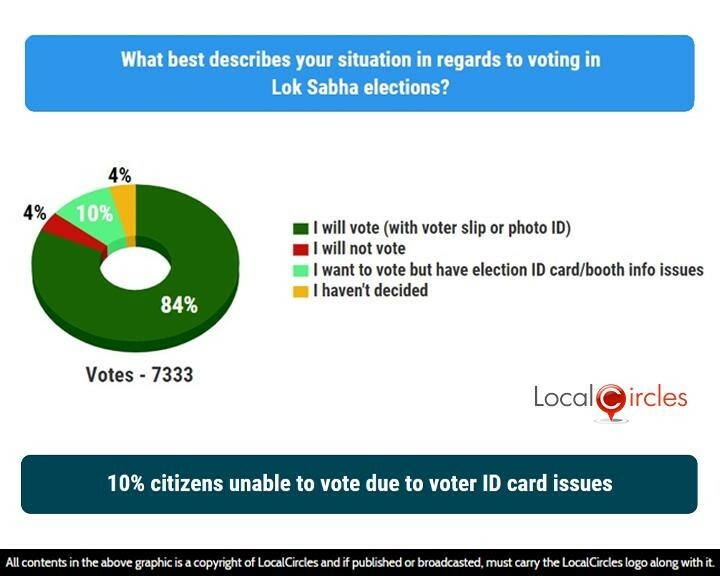 LocalCircles will be sharing the findings of this survey with Election Commission so actions can be taken to maximize the delivery of pending election id cards to citizens.